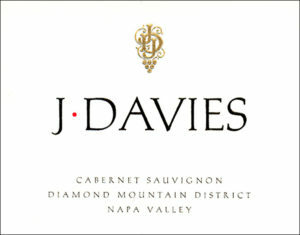 The Davies family, proprietors of Schramsberg Vineyards in Napa Valley, presents its eighth vintage of Cabernet Sauvignon. This wine is produced from the historic Diamond Mountain vineyards purchased in 1965 and replanted to Bordeaux varietals beginning in 1994. The wine is named in honor of patriarch Jack L. Davies, who along with his wife, Jamie, revived the Schramsberg property and established the preeminent American sparkling wine house more than four decades ago. A creation of the next generation of the Davies family, the J. Davies Cabernet Sauvignon is the product of an intimate knowledge of a place and a passion to create a delicious red wine. "Lifted floral, black cherry, Victoria plum, leaf and red berry bouquet. Intense floral/cherry fruit flavours on the palate and sweet tannins. It is bursting with fruit but finesse also. Has complexity and vigour with a full character." "Nicely focused, fairly deep, curranty fruit serves as the confident centerpiece of this well-crafted wine, ...it teases with complexing elements of briar and spice and neatly placed oak."